Now I know that the poll's winner (banana cream macarons) are long overdue and macarons have been absent from this blog for a while. Truth is, I made them yesterday and they failed :(. Being the pesky little cookies that they are, I've decided to put the macarons on hold for a few weeks... at least till my exam week is over. However, a beautiful Bundt cake will take their place this week! I got the inspiration for this cake when I was eating licking a naepolitan ice cream a few weeks ago. It made me reminisce of the three-layered neapolitan cake I made when I just started this blog. A three-tiered cake seemed a little ambitious during 75˚F weather, so I went the easy way and combined the three neapolitan flavors into one big & beautiful Bundt cake. Rating: 4 out of 5. - Preheat oven to 325 degrees. Butter a Bundt cake pan. Combine all-purpose flour and salt in a bowl; set aside. - Cream butter and sugar with a mixer on high speed until pale and fluffy, for 4 minutes. Scrape down sides of bowl. Reduce speed to medium, and add vanilla extract. Add the eggs, one at a time, beating until combined. With mixer on low speed, add flour mixture, beating until just combined. - Divide the cake batter in three parts. Add cocoa powder to one of them, mix until just combined. Add pureed strawberries and red food coloring to the second cake batter batch, mix until just combined. 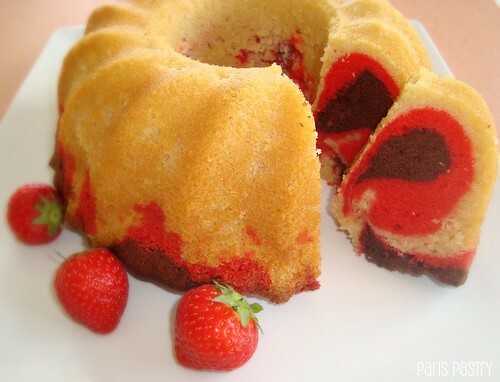 - Spoon the vanilla cake batter into the Bundt pan. Next, the strawberry cake batter, and final, the chocolate cake batter. Bake for 45 to 50 minutes, or until a cake tester comes out clean. Transfer to a wire rack to cool, 10 to 15 minutes. Turn out the cake onto the rack to cool completely. Before serving, dust with confectioners' sugar, if using. Cake can be kept at room temperature, wrapped well in plastic, for up to 3 days. je bent helemaal dol op de aardbeien he ;) erg vrolijke cake op deze manier!! @Cakeje Van Eigen Deeg: Helemaal! This cake looks so yummy! Thanks! this cake looks absolutely delicious! love the colours inside it! Amazing! 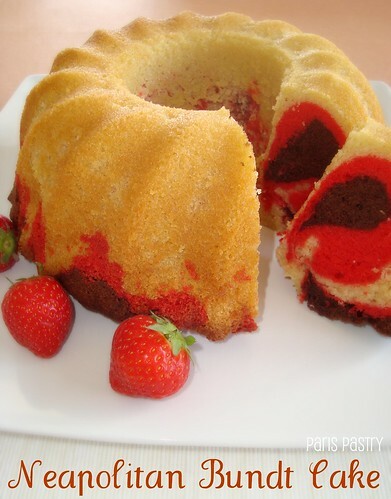 I love this cake, I know usually neapolitan is lighter pink but I love the red, it looks fantastic! este es uno de los postres mas deseado de mi vida! espero que algun dia se me de la oportunidad de hacerla y probarla. gracias por siempre poner cosas delicionas en tu blog.